You know when I was first asked to review a bathroom scale I was not real sure that was something that I wanted to do. I have not had one for a while and I was pretty sure I did not want one to weigh myself on now. Nonetheless, I think it is an important thing to have to help monitor your weight for health reasons and now that my husband has thyroid issues I think it is even more important. When the Smart Weigh SMS500 Smart scale came I was pretty impressed with the way it looks. This scale would fit into any kind of bathroom decor, and is quite fashionable actually. The best thing about this scale was that it does not laugh or say one at a time when you get on it! I love that! It is pretty neat as far as scale features go and it will help you keep track of whether your weight went up or down or staying the same. If you gain even an ounce the scale will turn red on the display and you know that its time to slow down, and if you have lost weight it will turn green in the display so you know that you are on track! Even though I do not like it to be pointed out I liked that it was an easy way to tell which way I was going. You simply have to stand on the scale to get it to work, there is no button to push or tap mechanism, you stand on it and you are being weighed. This has a nice backlit LCD with large n umbers so that you can see it well. They made this scale well, with precision mechanics and components that will alert you if your scale has been moved or needs to be re-calibrated. I really think all scales should have this feature, often times other family members move it for them to use and you would never know it. I think this is a perfect match for almost anyone looking for a new scale. The Smart Weight SMS500 has no set up needed, it features incredible auto recognitions functions for up to eight users. It is just great for you to read with its large LED display and it keeps things in check with its precision mechanics. 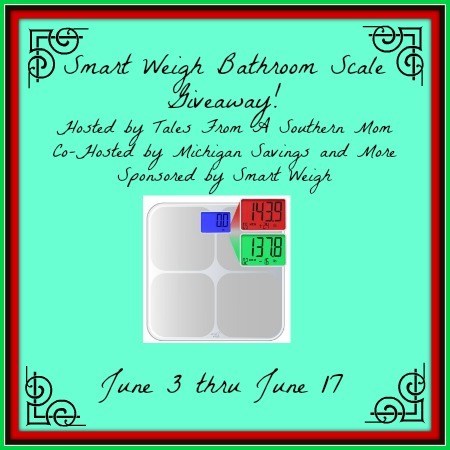 If you would like to purchase this scale for your home or as a gift you can do so at this Amazon Link, you also have the opportunity to win one in a fabulous giveaway that the Smart Weigh is sponsoring. DND Smart Weigh Scale Giveaway - Here We Go Again...Ready?